"Nautilus pompilius" redirects here. For the Russian rock band, see Nautilus Pompilius (band). The chambered nautilus, Nautilus pompilius, also called the pearly nautilus, is the best-known species of nautilus. The shell, when cut away, reveals a lining of lustrous nacre and displays a nearly perfect equiangular spiral, although it is not a golden spiral. The shell exhibits countershading, being light on the bottom and dark on top. This is to help avoid predators, because when seen from above, it blends in with the darkness of the sea, and when seen from below, it blends in with the light coming from above. The range of the chambered nautilus encompasses much of the south Pacific; It has been found near reefs and on the seafloor off of the coasts of Australia, Japan, and Micronesia. The oldest fossils of the species are known from Early Pleistocene sediments deposited off the coast of Luzon in the Philippines. Although once thought to be a living fossil, the chambered nautilus is now considered taxonomically very different from ancient ammonites, and the recent fossil record surrounding the species shows more genetic diversity among Nautiluses now than has been found since the extinction of the dinosaurs. Indeed, the taxon of the Chambered Nautilus, "Nautilus pompilius" is actually a grouping of tens of different species of Nautilus under one name. In 2011, scientists became alarmed at declining populations of nautilus resulting from overfishing, and have been studying world populations to determine the need for protection under the United Nations Convention on International Trade in Endangered Species. As of the 4th of Oct, 2016 at 8:15 pm during CITES Cop17 in Africa, all Nautilids were adopted into Appendix 2, offering them higher protection from massive trade demand. Unlike most cephalopods, the chambered nautilus lacks a larval stage. Their shells develop inside their eggs, and actually breach the top of the egg long before the nautilus actually hatches. They emerge as miniature versions of adults, roughly one inch in length. This was observed by a successful hatching of eggs by the Monterey Bay Aquarium in December 2017, which was recorded and posted to YouTube by the KSBW 8 News in Monterey, California. As a carnivore, it feeds on both underwater carrion and detritus, as well as living shellfish and crab. Mainly scavengers, chambered nautiluses have been described as eating "anything that smells". This food is stored in a stomach-like organ known as a crop, which can store food for a great deal of time without it denaturing. N. p. pompilius is by far the most common and widespread of all nautiluses. It is sometimes called the emperor nautilus due to its large size. The distribution of N. p. pompilius covers the Andaman Sea east to Fiji and southern Japan south to the Great Barrier Reef. Exceptionally large specimens with shell diameters up to 254 mm (10.0 in) have been recorded from Indonesia and northern Australia. This giant form was described as Nautilus repertus, but most scientists do not consider it a separate species. N. p. suluensis is a much smaller animal, restricted to the Sulu Sea in the southwestern Philippines, after which it is named. The largest known specimen measured 160 mm in shell diameter. The chambered nautilus is often used as an example of the golden spiral. 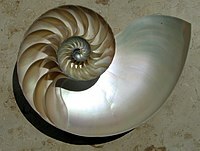 While nautiluses show logarithmic spirals, their ratios range from about 1.24 to 1.43, with an average ratio of about 1.33 to 1. The golden spiral's ratio is 1.618. This is actually visible when the cut nautilus is inspected. The shell of the Chambered Nautilus fulfills the function of buoyancy, which allows the Nautilus to dive or ascend at will, by controlling the density and volume of the liquid within its shell chambers. This was found during research done in New Caledonia on Nautiluses whose shell chamber fluid densities were tested at various depths, weeks apart. Generally speaking, Chambered Nautiluses inhabit a depth around 1000 feet, although further tests demonstrated that they can, and do, dive deeper. However, there are hazards associated with extreme depth for the Nautilus: the shells of Chambered Nautiluses slowly fill with water at such depths, and they are only capable of withstanding depths up to 2000 feet before imploding due to pressure. The chambered Nautilus inhabits different segments of the shell as it grows, continuously growing new, larger "cells" into which it moves its internal organs as it grows in maturity. All of the smaller chambers, once uninhabited, are used in the method described above to regulate depth. Nautilus shells were popular items in the Renaissance cabinet of curiosities and were often mounted by goldsmiths on a thin stem to make extravagant nautilus shell cups, such as the Burghley Nef, mainly intended as decorations rather than for use. Small natural history collections were common in mid-19th-century Victorian homes, and chambered nautilus shells were popular decorations. A painting by Andrew Wyeth, entitled Chambered Nautilus, shows a woman in a canopied bed; the composition and proportions of the bed and the window behind it mirror those of a chambered nautilus lying on a nearby table. The popular Russian rock band Nautilus Pompilius (Russian: Наутилус Помпилиус) is named after the species. American composer and commentator Deems Taylor wrote a cantata entitled The Chambered Nautilus in 1916. ^ a b c Ward, Peter. "Nautilus: Chambers of secrets". New Scientist. Retrieved 2016-12-13. ^ Basil, Jennifer A.; et al. "Three-dimensional odor tracking by Nautilus pompilius" (PDF). Journal of Experimental Biology. 203 (9). ^ Ryoji, W.; et al. (2008). "First discovery of fossil Nautilus pompilius (Nautilidae, Cephalopoda) from Pangasinan, northwestern Philippines". Paleontological Research. 12 (1): 89–95. doi:10.2517/1342-8144(2008)12[89:FDOFNP]2.0.CO;2. ^ Broad, William (24 October 2011). "Loving the Chambered Nautilus to Death". The New York Times. Archived from the original on 27 October 2011. Retrieved 24 October 2011. ^ a b c Ward, Peter (1988). In Search Of Nautilus. New York: Simon and Schuster. p. 72. ISBN 0-671-61951-9. ^ Pisor, D.L. (2008). Registry of World Record Size Shells. Fifth edition. ConchBooks, Hackenheim. 207 pp. ISBN 0615194753. ^ Nautilus pompilius suluensis ID:626793. Shell Encyclopedia, Conchology, Inc.
^ a b c d e f Ward, Peter (1988). In Search of Nautilus. New York: Simon and Schuster. p. 160. ISBN 0-671-61951-9. ^ "Nautilus Cup". The Walters Art Museum. Norman, M. 2000. Cephalopods: A World Guide. Hackenheim, ConchBooks, pp. 30–31. Pisor, D. L. (2005). Registry of World Record Size Shells (4th ed.). Snail's Pace Productions and ConchBooks. p. 93. Ward, Peter (1988) In Search Of Nautilus: Three Centuries of Scientific Adventures in the Deep Pacific to Capture a Prehistoric, Living Fossil. New York: Simon and Schuster, Print. Wikimedia Commons has media related to Nautilus pompilius. Wikisource has the text of the 1921 Collier's Encyclopedia article Pearly nautilus. This page was last edited on 16 March 2019, at 10:00 (UTC).